The Pedestrian Trail Bridge Community Working Group has set a date for the ribbon-cutting for the Jones Pedestrian Bridge on the South Huron Trail. Project Supervisor Kate Monk said people have been using the bridge since just before Christmas, but the main purpose of the official opening is to thank the donors who contributed to the project. 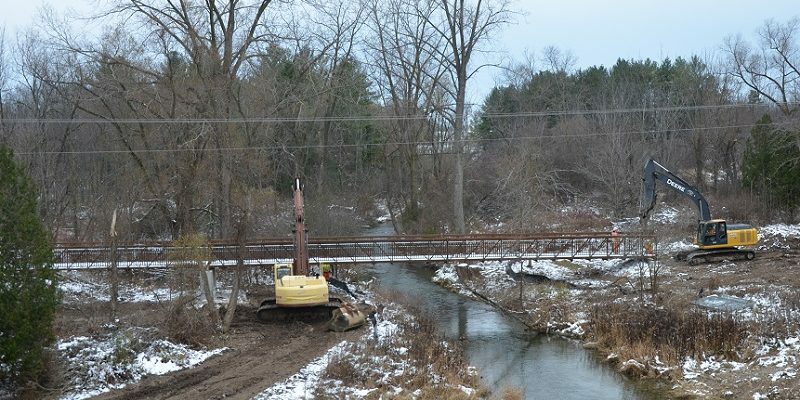 The bridge eliminates the need for people walking the trail to cross over the Ausable River and share the bridge with traffic on Morrison Line. “We’re waiting for things to dry up to do the final seeding around the trails, but all the connecting trails are in now and the stairs are completed, so all that is done. We just need to do the donor kiosk and the landscaping,” said Monk. The ribbon-cutting ceremony takes place on Saturday, April 27 at 10 a.m.